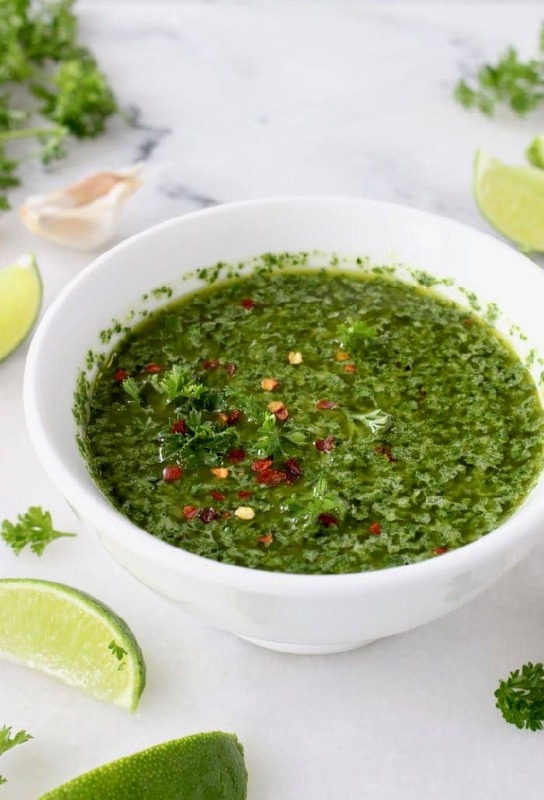 Easy Chimichurri Sauce – a savory garlic, parsley and oregano sauce recipe originated in Argentina and used as a condiment or marinade for your favorite dishes. Think tacos, plant-based veggie burgers, grilled vegetables, roasted sweet potatoes and even pizza. 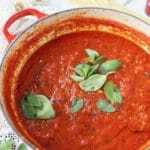 What I love about this sauce besides the garlic and that it can be made in advance, is that you can whip it up it by hand, quick and easy without the use of a food processor, blender or machinery. All you need is a sharp knife to chop the parsley and oregano in a rustic manner. There is no cilantro in the authentic Argentinian recipe, but it is commonly used through South America and California today. If you fancy the cilantro version by all means go that route using half parsley and half cilantro, just don’t call it “ traditional ” or the chimichurri police might take you to jail right away 😉 If you want to be a real rebel at heart I’d encourage you to go for a basil and lemon version. You might also want to double the recipe here as chimichurri sauce keeps well stored in a tight jar in the refrigerator, about 10 days or so. If you wanted to you could even freeze it in ice cubes trays then transfer to freezer bags for later use. Note worthy: make sure to grate your garlic really fine as sometimes simply chopping it will make it taste bitter. Also, nobody likes to bite into a raw piece of garlic right ? By grating it you get all that amazing garlic flavor throughout the sauce in every bite. 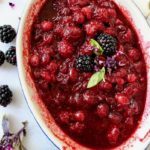 If you are on a plant based oil-free diet you can adapt the recipe why using a little water or lime juice to stretch out the sauce. 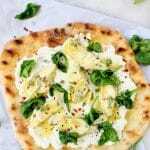 As always If you make this recipe remember to come back here and rate it, snap a photo and tag us with #VeggieSociety on Instagram. 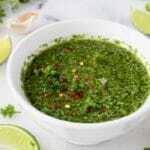 Easy Chimichurri Sauce Recipe with Parsley, Oregano, Garlic and Lime. Vegan, Paleo, Gluten Free, Plant Based Awesomeness Argentinian Style! 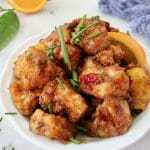 Transfer the sauce to a bowl or a jar and stir in the grated garlic and red pepper flakes. Season to your taste with the sea salt and more lime. 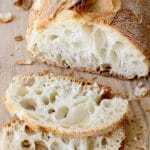 Store in the refrigerator in a tightly closed jar / container for up to 10 ways or freeze for later use. Hello! 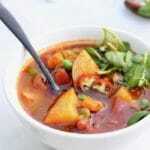 This recipe calls for a chili pepper but, what kind? thanks! Your favorite 🙂 Red, green, extra spicy, less spicy, however much heat you can handle! 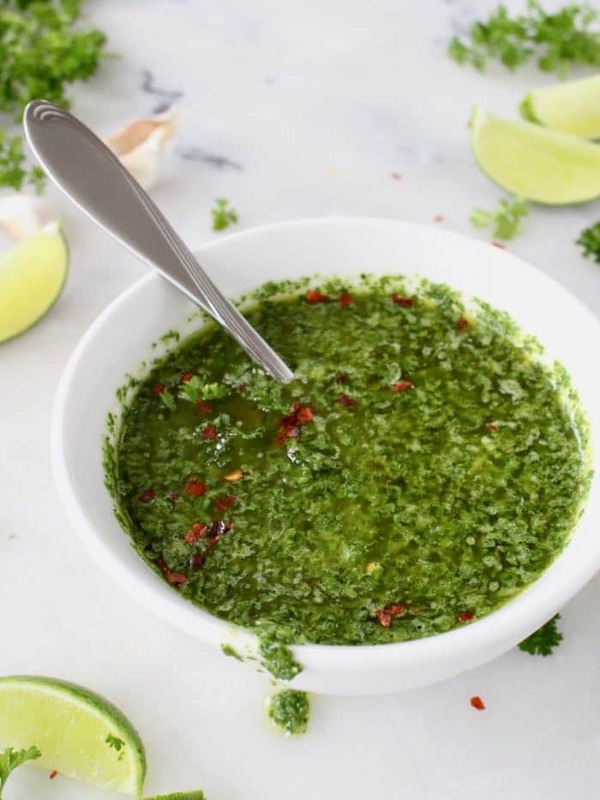 Just wanted to come by and say this Chimichurri sauce was the hit of the party this weekend, I actaullay made a second batch since everyone was looking for more. Thank you Florentina!